The handkerchief of silk or other light material is one of the most popular accessories for women. Women wear handkerchiefs, tying them at the neck, the wrist, using as headbands. And almost every season it is fashionable to wear original scarves, decorating them handle or the pockets of the bags. Beautiful scarf is able to make a highlight in any image. Of course, just organically accessory will look great in a classic style, but you can choose it for office, parties, Hiking. Tie a scarf around his neck in many different ways – carelessly to throw, to generate a node or to do something special. How to wear a scarf on your purse? The easiest option is to tie a handkerchief from weightless silk on the handle of her purse. This solution is useful in hot weather when you took the handkerchief from his head or neck but don't want to put it in the bag. For these purposes, you can use a scarf with a print, geometric pattern or a solid thing. As long as it was combined with other parts of your image. The handkerchief will look beautiful on bags of different materials – cloth, leather, braided, suede, etc. For decorating bags often choose thin scarves of silk, muslin, chiffon. These fabrics drape well, the beauty of summer scarves that every day can be changed, as a result, the same handbag will look different. The tissue can saaksisaatio defects in the handles or worn on the sides of the reticule. Scarves as accessories worn in the locker room and young girls and Mature women. According to the latest fashion trends when choosing scarves for handbags do not need to be afraid of bright colors and bold patterns on the fabric. How to wear a scarf on the bag? Feminine bag with scarf looks very romantic. And you can place with the help of accessory can be as a small handbag, and quite a large size model. But the headscarf also need to choose in proportion to the size of the bag. When choosing a shawl to wear to the handle of your bag, you must consider the tone of the accessory. In other words, do not mix the two too bright or colorful things. Appropriate will look like a bag of pastel shades and colorful scarf and Vice versa. Also try to pick up the handkerchief the color of the shoes, especially if the bag and shoes are the same shade. Stab the scarf on the purse is possible by means of brooches or simply tie a kerchief knotted to her, the ends flapping in the wind. At any moment the handkerchief again can be removed from the handle of the bag and tie it around your neck or head if the weather changes. 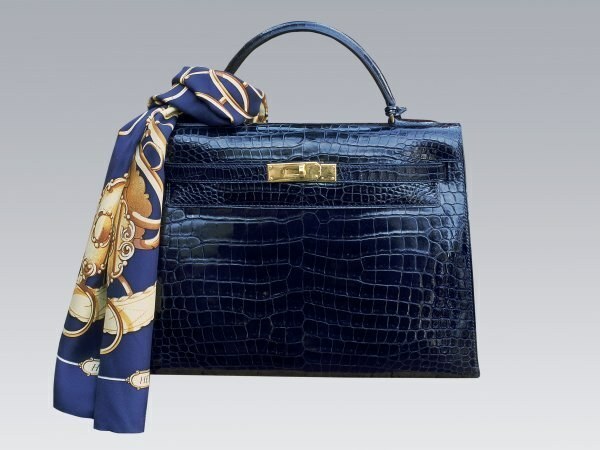 It is believed that for the first time to wear a scarf on the handle bags women began in Italy. In this country today scarves from a nice body silk often choose wealthy ladies. If you want you can buy two of the same shawl and use a kerchief as a neck scarf, and the second decorate a trendy handbag. This spring look will benefit.